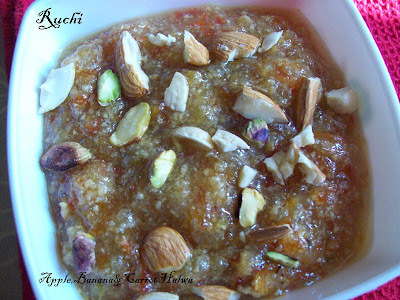 ABC Halwa is a most popular Indian Dessert .In short we say ABC Halwa. Made Of Apple , Banana ,Carrots Cooked in Milk . It has a Very Rich Taste, Easy to make and Nutritious. This Halwa is rich in Vitamin A & C .The sweet and juicy apple carrot and banana fused together form and created such an exotic tastes and melts in mouth. This Halwa is rich in Vitamin A & C and nutritious Sweet dessert. 1.Cook grated carrots in milk until cooked. 2.Add grated apples and smashed banana and cook. 3.Then add sugar and mix all the ingredients together. 4.Keep on stirring till the apple & banana pieces are cooked and the halwa becomes one mass. 5.Add ghee to the mixture and mix well till the Ghee oozes out. Then add cardamom powder. 6.Remove from heat and garnish with chopped almonds ,cashew nuts and pistachio. Yummm....!!! These are ings which v have at home usually..Sure to be hit at parties..
delicious and interesting combination.. looks amazing !! Yummm, feel like finishing them, sooo tempting halwa.. Thank you girls for your lovely comments.Wishing you all a very Happy newyear!